We’re staying in east London at the restored Great Eastern Hotel. In the late 1800’s it was a beautiful hotel connected to the Liverpool Train sation. And now it’s back. The exterior is restored to it’s 19th century grandeur but the interior has gone modern, very modern. The guest rooms are called “smart rooms”. Everything is automated and calibrated to the highest technical speficication. The toilets don’t flush, instead there is a vacuum that evacuates the bowl before a rinse cycle is engaged. The vacuum is so powerful, it could pull a small child through the pipes. The east end of London is mostly comprised of the Finanacial District. When we were here years ago it was all pretty spooky. This is the home of Jack the Ripper, the 10 Bells Pub and the Spitalfields Market. But properous London has burst through the post war boundries and reclaimed the East end. This was once home to the poorer working immigrant classes. Not no more. Now it’s the brand spanking new Financial district and real esate prices are tiling the scales. The only problem with the East End is finding anything to do after 6pm, everything closes down with the Financial district. With the exception of an Indian restaurant (there is always an Indian restaurant open in London) it’s really hard to find a place for dinner. We have a few fun filled days in London. 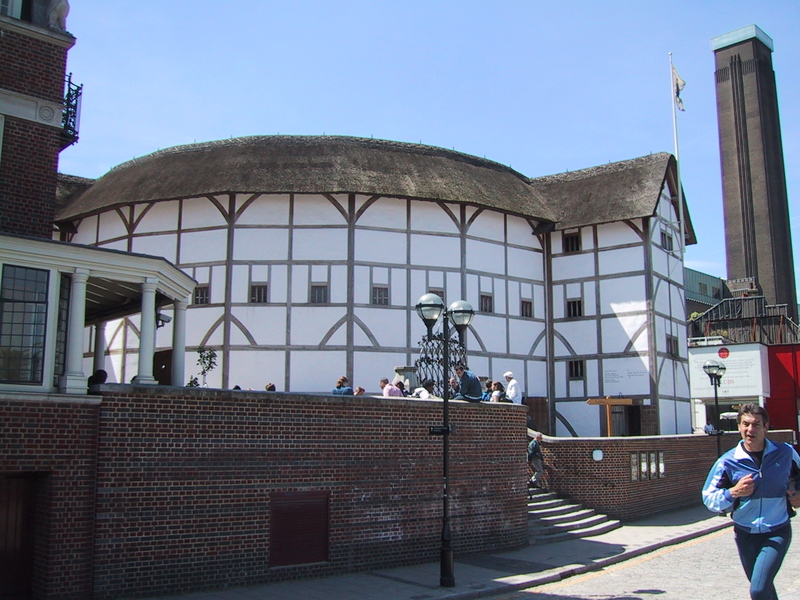 We caught a performance of King Lear at Shakespeare’s Globe theatre, the 1997 version of the 1614 Globe theatre recreated close the site where the Old Globe once stood. The theater is on Bankside, very close to the newly opened Tate Modern Museum. It’s a nice walk from the east end to the new British National Library near St. Pancras Station. London is one of the best walking cities in the world. This is no ordinary library. Once the new building was completed in 1973, manuscripts and historical documents once housed in the British Museum were moved here. There are more than 14 million books and manuscripts collected here, including; a Guttenberg Bible, two copies of the 1215 Magna Carta, Lewis Carroll’s manuscript of “Alice in Wonderland”, a notebook of Leonardo da Vinci, and John Lennon’s handwritten lyrics to “In My life”, to name a few. It was very funny when we came to the front of the building. There was a school outing visiting the museum. Their uniform was very similar to Gretchen’s outfit of the day. The new and improved British Musuem (the new courtyard design by noted architect Norman Foster is fantastic), is fantastic. 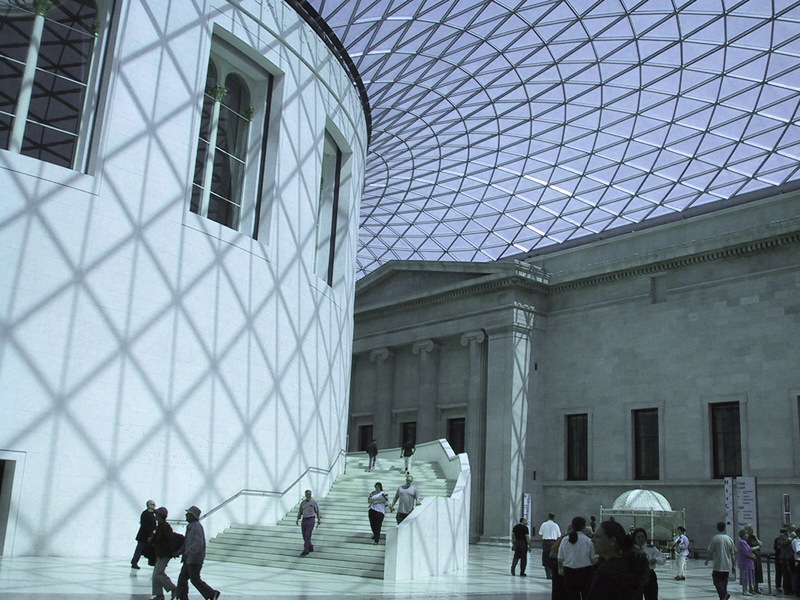 This is one of the best museums in the world, but also one of the most controversial. Many of the collections are constantly under fire as being stolen property. The Brits claim that the antiquities here are safe and accessible to everyone (by the way, the museum is also free of charge) but some countries aren’t buying it. Greece want the marble frieze panels of the Parthenon stolen by Lord Elgin in the early 1800’s. Egypt wants the Rosetta Stone and a lot of other artifacts. Nigeria want the 200 or so brass carvings stolen in from the Palace of Benin in the late 1800s. England is currently living with “finders keepers, losers weepers”, but who knows what will happen. History has a habit of being rewritten. But for now, the wrold will still have to opportunity to see them all in this one amazing museum. 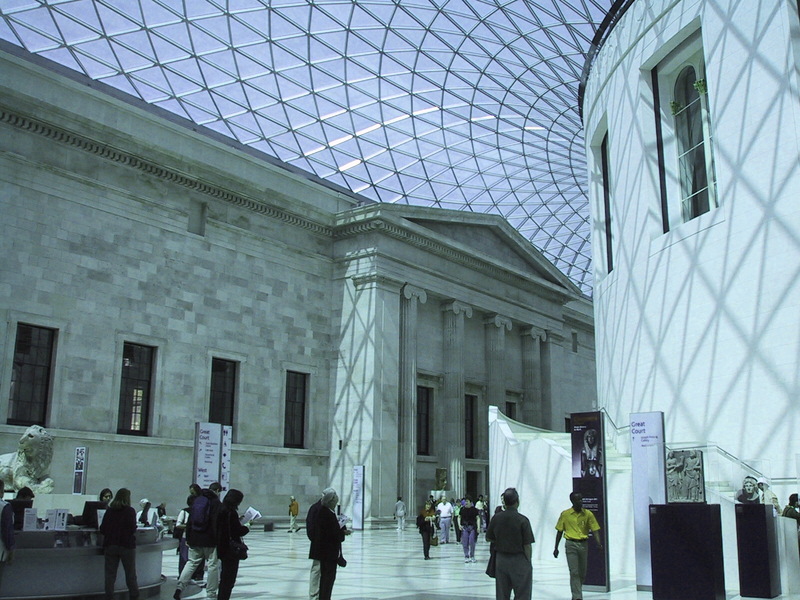 The British Museum began in 1753 when Dr Hans Sloane bequeathed his collection to the country. Sloane, aside from being a great collector of artifacts was responsible for the creation of milk chocolate and prescribed it as a cure-all to anything. By the end of the 18th century the entire country was drinking large quantities of Sloane’s concoction, which by the way was used in the original formular for Cadbury Chocolate. Although the chocolate obsession was a little strange, Sloane was no run of the mill quack. He was the Royal Physician to Queen Anne and Kings George I and II. The New Tate Modern just opened at the old Bankside Power Station. It’s an enormous building with 4 levels of gallery space highlighting art from the 20th and 21st century. Some of it is wonderful, some is just bizarre, but’s tat’s what art is all about. One of the temporary exhibits is a large slide that lets you skip the line to the elevator. Weeeeeeeee….it’s a long way down. 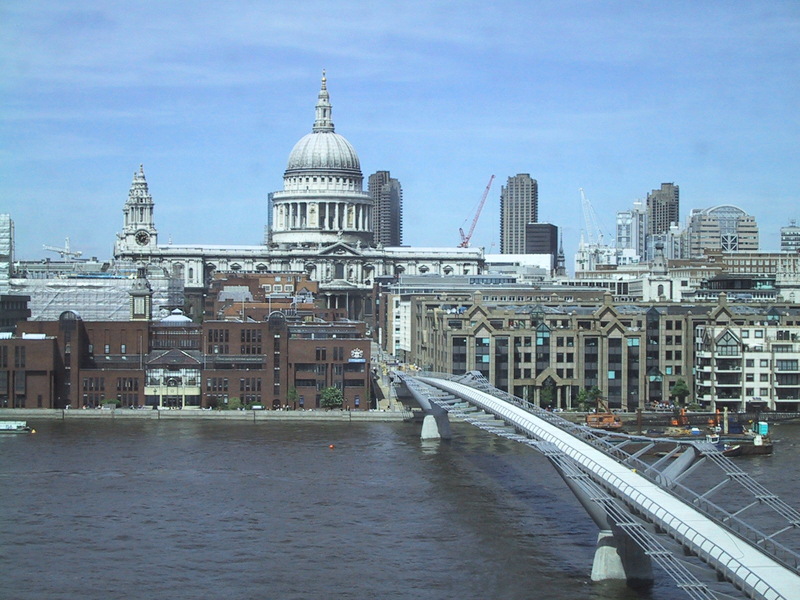 From the inside of the Tate we can see the empty Millenium footbridge across the Thames from Bankside to the City of London. It hasn’t opened up yet. It was supposed to be completed for the Millenium celebration in 2000 but something went wrong. It sways a lot more than expected, so much that the media has re-named it the Wobbly Bridge. They’re still trying to figure out what to do. The bridge is wonderful. 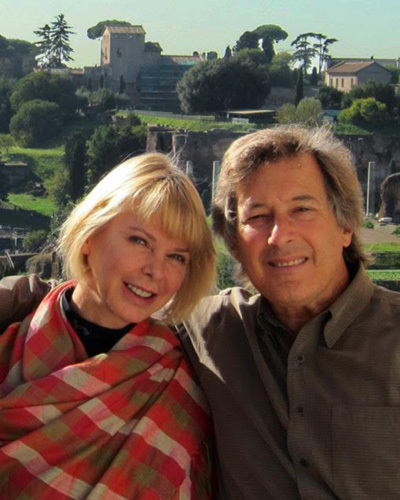 It’s filled with street musicians, people and fabulous views. We knew they’d get it right.